config.sys files for use with memmaker. Automatically optimize your startup files for best use with MS-Memmaker. Maxopt is provided as shareware. Under the shareware concept, you can test a program before you buy it. If you find it suitable to your needs and make use of this program, you are expected to register it. Feel free to distribute this software to others. However you may not charge for the distribution of this software to others nor may you alter the software or this documentation. DISCLAIMER: This software is provided "as is" without warranty of any kind, either expressed or implied. Your registration fee entitles you to use this software on a single computer. Site licenses are available, write for details. MEMORY!!! To a computer, this is perhaps the single most important commodity, and most important of all is 'conventional' memory. Conventional memory is where the programs load and run, therefore the more you have of it, the better. Lose enough conventional memory, and some programs cannot even run. With all the TSR's & device drivers on the market today it can get difficult to keep the amount of conventional memory in the 'safe' zone. 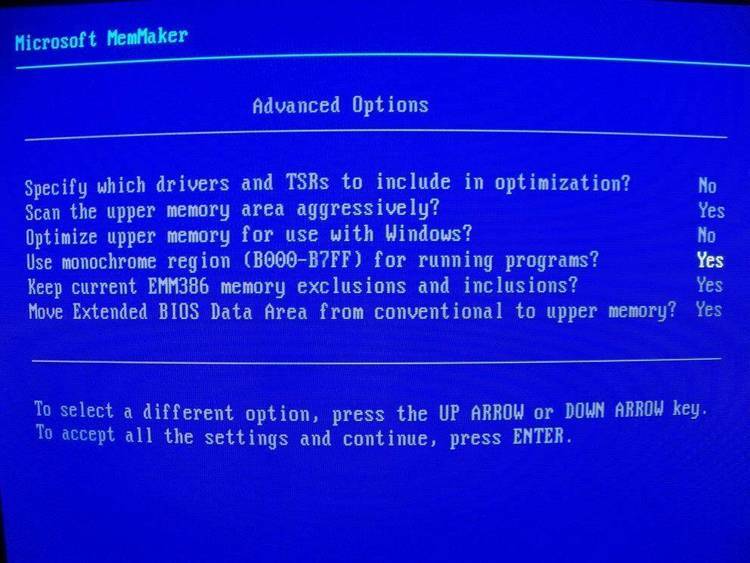 Along comes MS-DOS's 'MEMAKER' program. This is a sweet little program that is supplied with your DOS files that attempts to place these TSR's and device drivers into a region called 'upper memory' therefore freeing up more conventional memory. Unfortunately, you also have only a finite limit of upper memory so that with enough TSR's and drivers, even MEMMAKER can do no more. "When memory-resident programs are loaded into upper memory, it is most efficient to load programs that require more memory before programs that require less memory. Although MemMaker fits your device drivers and memory resident programs into memory as efficiently as possible, it does not change the order in which those programs and drivers load. You can fine-tune your memory configuration by changing the order of the commands in your config.sys and autoexec.bat files. When you run MemMaker, it measures the memory requirements of each driver or memory-resident program and stores this information in the MEMMAKER.STS file. You can use this information to determine the optimum order for your config.sys and autoexec.bat commands." The reason for this re-ordering of commands is that a device driver or TSR may request considerablly more memory that it actually leaves resident. A good example of this is the mouse driver. At startup, this driver resquests about 57000 bytes of memory but only leaves a little over 17000 bytes resident. So even if you had enough upper memory for the resident portion of the driver, if you don't have the 57000 originally requested, memmaker cannot load the driver high. The steps required to fine-tune your startup files is not overly difficult, but if you are constatntly trying out new programs it can be time consuming. I am one of those that am constantly trying out the newest programs and so I wrote 'MAXOPT'. This program examines your autoexec.bat, config.sys, and memmaker.sts files and automatically re-orders the commands in the correct order. Once you have this startup disk made, you are ready to use maxopt. If, for some reason, you have not used 'memmaker' before, you need to run it before using maxopt as the 'memmaker.sts' file will not be available until memmaker is run. Unzip 'MAXOPT.ZIP' to the directory of your choice. The name of the directory does not matter, but all files MUST be in the same directory. To run, simple type "maxopt" from the command line. Although maxopt was written to run in DOS, I have had no problems running it from windows and know of no reason why it shouldn't work as well. Before 'MAXOPT' can re-order you commands, it must know where the 'autoexec.bat', 'config.sys', and 'memmaker.sts' files are located. The startup files are usually located in the root directory and memmaker.sts in the DOS directory. However, to insure that maxopt will work, it assumes nothing and gives you the option to enter the locations manually or have the program search your hard drive for them. You can use the mouse cursor or keyboard to enter you selection. If you choose to enter the locations manually, type in the complete path to the files as they are requested (i.e. autoexec.bat ?? c:\ , config.sys ?? c:\ , Memmaker.sts ?? c:\dos\). If you know the locations, manual entry is probably the fastest method as an auto search of your entire drive can take a little time. Once the locations are known, you are then given several options to chose from. Option 1 --- "Just do it"
Use of this option is recommended after you have run maxopt a few times and confirm that it will work properly on your system. This option reads the .sts file and re-writes your autoexec.bat and config.sys files immediately. It also creates *.bak files so that if you do not like the changes or if the changes did not result in any gain in conventional memory you can restore you system to the original. This is the fastest way to change your files. Option 2 --- "Let me see"
This option does the same thing as option 1 but instead of re-writing your files, it creates *.chk files in the directory maxopt is installed in. You can view these files with any text editor. If you like what you see, you can re-name them to "autoexec.bat" and "config.sys" and move them to your root directory. Be warned , however, that unless you do it yourself, there are no *.bak files created and maxopt will not be able to restore your system to the original state. Option 3 --- "Didn't like it"
Let's you restore your system to the original configuration if *.bak files are in the maxopt directory. Option 4 --- "Out'ta here"
exits program with no changes made. Once you have run maxopt, you will have your files in the optimum command order. Run memmaker again. With any luck, you will see an increase in conventional memory. If not, there is no more that memmaker can do for you and you will have to use other options to gain more memory such as multiple configurations. Please note that if you are not overloaded with memory-resident programs or device drivers, maxopt accomplishes nothing but optimizing your startup files. It is a prigram that simply takes the drudgery away from manually re-configuring these files when needed.